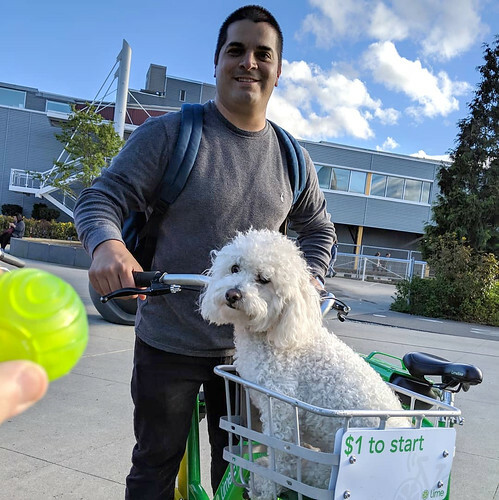 You may have seen the Seattle Times article about how local employers are getting their employees to making other transportation choices instead of driving to work alone. 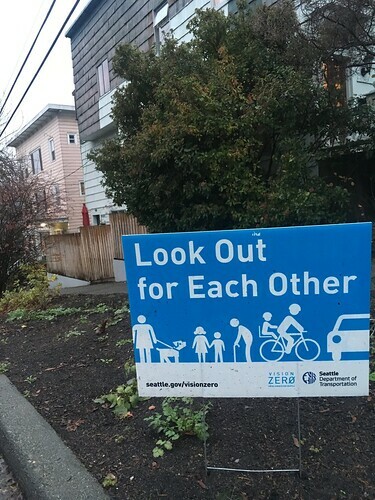 Here at SDOT, we have a name for that – it’s our Commute Trip Reduction (CTR) program! Housed in our Transit & Mobility division, we’ve worked hard to achieve success with CTR. We contract with Commute Seattle to provide CTR programming in Seattle. We’ve given a little CTR history before, but just to refresh your memory: in 1991, the State legislature passed the Commute Trip Reduction (CTR) Act, requiring that large employers (100+ employees) encourage their employees not to drive alone in order to help reduce carbon emissions and keep people moving. 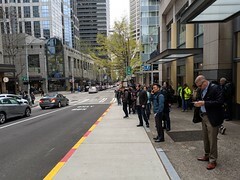 SDOT connects employers with transportation resources and services that enhance these programs. Appoint an Employee Transportation Coordinator (ETC) to be the primary contact between the employer and the City to administer and promote the employer’s CTR program. Exercise a good faith effort by collaborating with the City in its administration and implementation of the law. There are many types of benefits employers offer to help make your commute easier and cheaper! Since 2011-12 to 2015-16, our citywide DAR (Drive Along Rate, remember?) fell from 35.93% to 34.18%. That may not seem like much, but every percentage point counts! That’s despite more and more CTR commuters and trips into our rapidly growing city. With your help we’ll continue to make considerable progress towards our goal of 10% DAR reduction! Numbers from Commute Seattle’s Modeshare Study show how the system is accommodating new residents and workers. From 2010-2016, downtown Seattle added approximately 45,000 jobs, but 95% of the gain in net commute trips was absorbed by non-drive alone modes. How will you get to work? Today is National Dump the Pump Day! It’s the 12th Annual National Dump the Pump Day, sponsored by the American Public Transportation Association (APTA), encouraging people to ride public transportation and save money! According to the APTA, in the Seattle area, you can save nearly $1,000 a month, or $12,000 a year by riding transit! Riding public transit can also contribute to healthy neighborhoods by encouraging pedestrian activity, smart growth, and economic development. The City of Seattle works closely with King County Metro, Sound Transit and other transit providers to enhance transit service. The City is committed to making transit a more efficient, affordable choice for more people taking a wider variety of trips. We’re building projects and planning for the future. The voter approved Move Seattle levy provides funding for transit corridor improvements, including seven new RapidRide corridors. 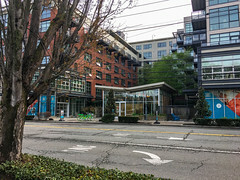 The Seattle Transportation Benefit District provides funding for the City to purchase transit service from King County Metro. 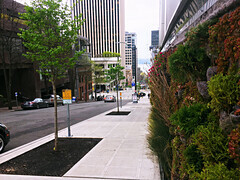 The City owns the South Lake Union and First Hill streetcar lines and contracts with Metro for operations. Later this year construction begins on the Center City Connector which will connect the two existing streetcar lines through the heart of Downtown. See other transit improvement projects we are working on. Also, June is Ride Transit Month! Let us help you find and plan a transit trip, with our Rider Tools resource page. June is Ride Transit Month! SDOT and our partners are celebrating our investments in Seattle’s transit system and we want to thank YOU, the riders who are using it. 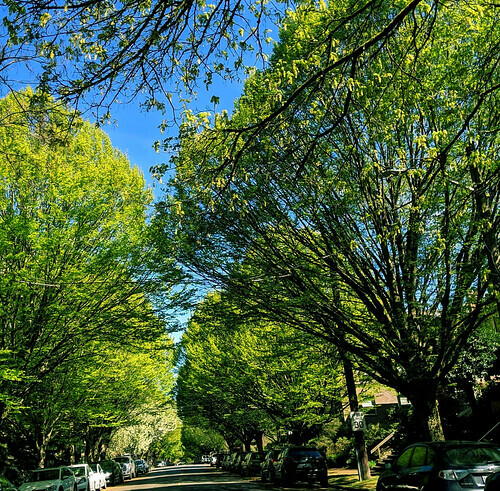 Whether you’re on a bus, light rail, train, ferry, vanpool, water taxi, or streetcar, enjoy the ride and know that you’re part of a great movement in Seattle! 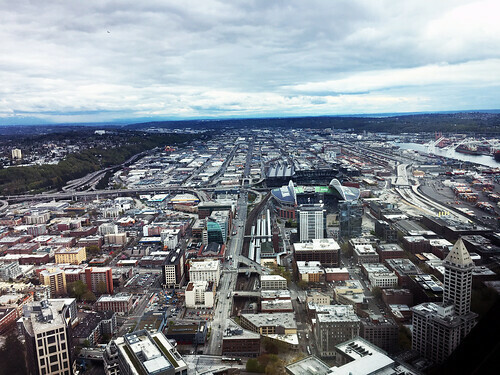 As is probably clear from our changing skyline, Seattle is a growing city. Over the past 20 years we have gained 100,000 residents and 50,000 new jobs. Over the next 20 years, however, we expect a faster rate of change, anticipating 120,000 new residents and 115,000 jobs. In order to accommodate this growth, we are growing our transit system. 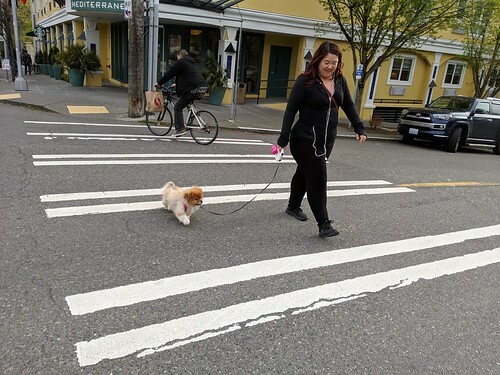 As of this investment, 51% of households are within walking distance to 10-minute or better service – more than 2/3 of the way to our Move Seattle 2025 goal of 72%. 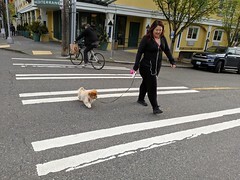 Additionally, STBD funds programs such as ORCA LIFT and Youth ORCA, which seek to reduce the cost burden associated with transportation and encourage more people to use transit. 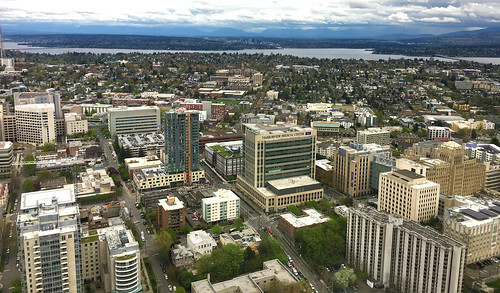 At the same time, our partners at King County Metro and Sound Transit have also been working to invest in growing the system, with the latter poised to expand over the next several decades via the passage of Sound Transit 3 last year. Numbers from Commute Seattle’s Modeshare Study and our Commute Trip Reduction program show how the system is accommodating new residents and workers. From 2010-2016, downtown Seattle added approximately 45,000 jobs, but 95% of the gain in net commute trips was absorbed by non-drive alone modes. The transit mode share increased from 29% in 2000 to 47% in 2016, while the rate of those driving alone to downtown decreased from 50% to 30%. Transit is allowing the city to grow and also keep moving. So, if you’re a transit rider, thank you, and keep on riding! And check out Ride Transit Month celebrations around the city this month, including fun events and exciting prizes. Some lucky riders could win big. Stay tuned to http://www.ridetransitmonth.org/ for more information! Our Commute Trip Reduction (CTR) program recently featured some of the city’s champions when it comes to the best workplace commute programs. The City of Seattle also does well in reducing commuter trips thanks to a comprehensive employee commute options program, and its dedication to using modes other than driving alone whenever possible. 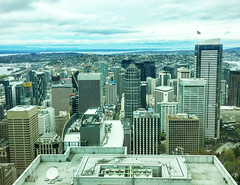 The City’s Central Business District (CBD) includes the Seattle Municipal Tower, Justice Center, and City Hall. 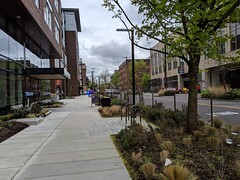 There are approximately 7,000 employees in this district and 5,500 of them arrive during the peak commuting times of 6-9 a.m. Out of these employees, only 15.9% reported driving alone to work, including motorcyclists – well below the downtown average of 20% for large employers. This figure has decreased from 17.0% in 2007. 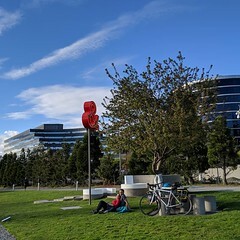 To ensure all City employees know about their commute options, a City Employee Transportation Coordinator (ETC) provides a detailed employee orientation about ORCA cards, bike parking, emergency rides home, and many other elements of their commute options program. City of Seattle invests in ORCA Business Passport in order to provide a 100% employer-covered transit commuting pass to its employees. More than 80% of employees who commute during peak hours to the CBD sign up for this ORCA benefit. The City also provides discounted parking for carpools and vanpools, which more than 245 commuters take advantage of. Finally, employees who bike to work have access to a weekly, on-site bike mechanic and one discounted tune-up per year, shower and locker facilities, secure indoor bike parking, and more. More than 300 employees take advantage of the bike program at the CBD. 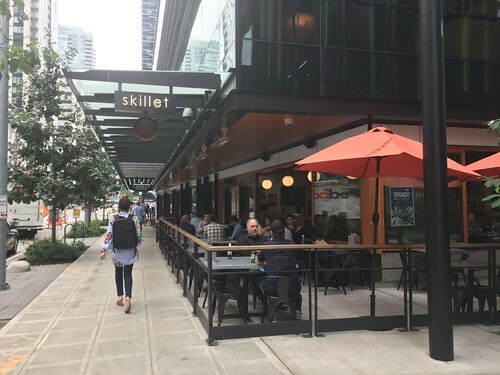 Companies looking for ways to offer more commute options to their employees can use these examples of what the City does downtown, or get in touch with Seattle’s CTR program for further details! SDOT today announced a pilot incentive program with Scoop Technologies, an app-based provider of flexible commuter ride sharing, to encourage carpooling and help ease congestion in the region. 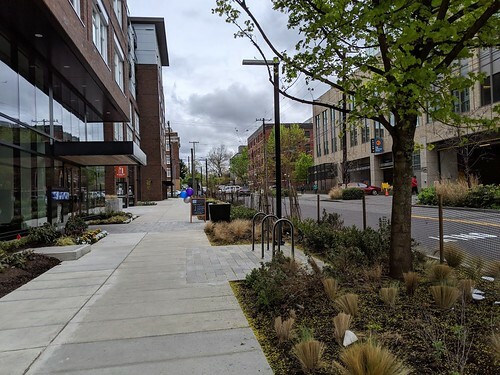 With funds from the City’s Commute Trip Reduction (CTR) program, the pilot will provide reduced price trips for carpoolers arriving and departing from a designated area in the South Lake Union neighborhood. The free Scoop carpooling app enables commuters to share their trip with coworkers and neighbors. The pilot program incentives are for those who live or work in zip codes 98109 and 98121. Commuters will receive reduced price Scoop trips starting on Monday, April 17, and lasting approximately three months. Seattle’s CTR program will contribute $49,000 of state funding to provide the incentives for the pilot, which will allow $2-3 off each trip for each participant. 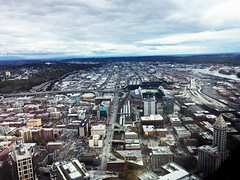 The City of Seattle is the first city outside of the Bay Area to sponsor Scoop trips for both residents and employees. For more information on Scoop, visit www.takescoop.com. For more information on carpooling or other transportation options in Seattle, please visit: http://www.seattle.gov/waytogo/wtg_pool.htm. Seattle Companies are Commuting Champs! Seattle’s Commute Trip Reduction (CTR) program works with the city’s largest companies to reduce congestion by decreasing the numbers of drive-alone trips during peak hour commutes. The CTR Champions program recognizes employers who achieve notable reductions, provide innovative and comprehensive employee commuter programs, and have high levels of participation. 76 companies were recognized with awards this year. This year’s CTR Champions Awards event on March 9th was themed “Going Further” and Mayor Ed Murray gave opening remarks. Mayor Murray at the 3rd Annual CTR Champions Celebration. 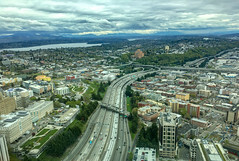 The City and its partner Commute Seattle recognized 76 out of 257 large employers, including The Bill and Melinda Gates Foundation and Stoel Rives LLP, which received the City’s highest “platinum level” recognition. Andrea Watanabe, with Tableau, was recognized as an Outstanding Employee Transportation Coordinator. Since the passage of the State’s CTR law in 1991, Seattle’s Drive Alone Rate (DAR) has been decreasing. SDOT works with CTR-affected companies to support them in providing robust employee transportation programs to help continue this trend and reach our goal of a 32% DAR citywide* by 2018. Seattle will continue to grow, meaning that the vast majority of new trips will be taken via means other than the single-occupancy vehicle. We look forward to 2017 and beyond to continue to help Seattleites get to work – because a happy employee begins with a happy commute. *Differs from results of a recent Commute Seattle survey that found less than 30% of downtown’s estimated 247,000 daily commuters now drive alone to work – this refers to commuters into downtown versus citywide. More than 70% of downtown Seattle commuters are choosing not to drive alone. Our recent Commuter Mode Split Survey Report shows that more than 70 percent of downtown’s estimated 247,000 daily commuters opt for transit, ridesharing, biking, walking and teleworking – leaving less than 30 percent of commuters to drive alone to work. That continues a strong downward trend in solo driving from 35% in 2010 to 31% in 2014. Employers see the value of a good transportation system. Downtown employers have invested over $100 million in infrastructure and transportation benefits. Downtown Seattle added 45,000 jobs from 2010 to 2016, and an impressive 95% of the increase in daily commute trips have been absorbed by transit, rideshare, biking and walking. Funding for new transportation options. 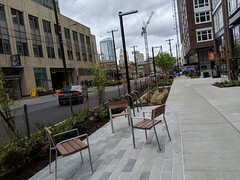 In addition to private sector investment, voter-approved initiatives TransitNow, Seattle Transportation Benefit District (STBD), and the Levy to Move Seattle have provided funding for new transportation options for downtown commuters. 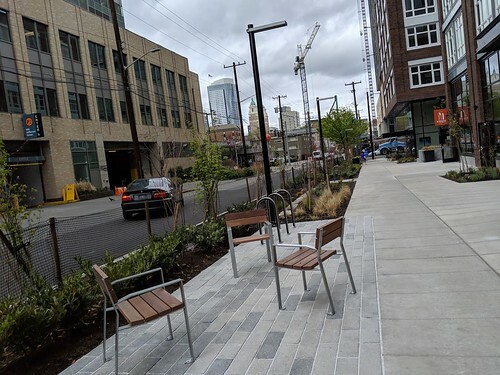 These include the City of Seattle and King County Metro coordinated service expansion of the RapidRide C and D lines, and implementing the 2nd Avenue and Westlake protected bike lanes, which enhance safety and bike capacity to and through downtown. 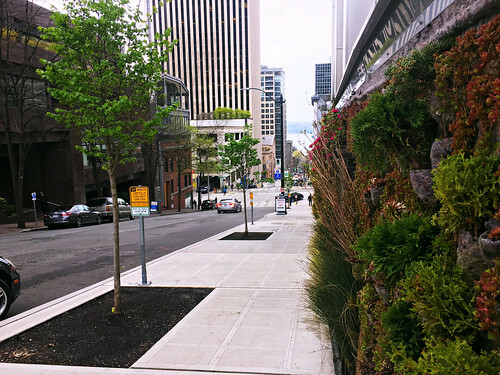 Meeting goals to reduce the downtown Seattle drive-alone rate. These results fulfill a 10-year goal to reduce the downtown Seattle peak commute drive-alone rate to 30%, accomplished by Commute Seattle at the direction of the Downtown Transportation Alliance (DTA)—a public-private partnership comprised of the Downtown Seattle Association, the City of Seattle (SDOT & OPCD), King County Metro, and Sound Transit. Every year, thousands of Seattle commuters get to work using a van or carpool. Not driving single occupancy vehicles helps reduce congestion and carbon emissions – as well as being a convenient way to save on commuting costs. But, the fee for a Vanpool parking permit hasn’t been updated in over 20 years, and has not kept up with rising costs for carpool parking or administering the program. To align these costs, and ensure the financial viability of the Vanpool program, the Seattle City Council approved a schedule for permit fee increases over the next three years. So, is the price going up? Yes. Are Vanpool on-street parking permits still significantly cheaper than carpool or private parking? Absolutely! We understand this represents a cost increase for Vanpool commuters, but it is important to note that Vanpool parking rates have not kept up as carpool and private parking fees increased significantly. For a 5-person vanpool in the CBD, a rider’s parking cost in 2017 will increase from $0.33 per month to $13.33 per month. In 2019, each rider would pay $40 per month. In contrast, for a 2-person carpool in the CBD, each rider today pays $100 per month. And for a 5-person Vanpool parking off street in private lots or garages, which most do, fees are currently $300-$400 per month, or $60-80 per month per person. It’s also important to note that 5 people is just the minimum required for a Vanpool. If you filled a Vanpool to capacity at 15 people, the permit fee per person would be just $4.44 in 2017, or $13.33 in 2019! Of the over 800 Vanpools currently in use in Seattle, the vast majority park off-street in private lots or garages, and only about 70 park on-street and will be impacted by this fee increase. We remain committed to Vanpooling, as well as other forms of shared transportation and transit. As our city grows, it’s increasingly important alternative forms of commuting are easy and attractive. To join a Vanpool, or start your own, check out the King County Metro page. Seattle has a lot of options to get around including walking, biking, transit, driving and carsharing. Carsharing provides on-site, on-demand access to a vehicle. Carshare systems are designed for round-trip and one-way use depending on the service provider and location, with users paying an annual membership fee and a fee for the hours rented or distance traveled. Seattle-based ReachNow launched in April and recently added 180 cars to its Seattle fleet. ReachNow also recently announced it’s lowering the age requirement for drivers from 21 to 18. Seattle is Car2Go’s largest U.S. market, and the service has 750 cars in the city. Car2Go launched in Seattle in 2012. Zipcar is now offering 100 cars in their 500 car fleet that can be used for one-way trips. All told, there are a lot of new options and services available to commuters to complete the “first and last mile” of a transit commute – the beginning or end of an individual trip made primarily by public transportation. As carshare services become more available, they’ll increasingly complement transit service as a “first-mile/last-mile” solution and continue to give commuters new options for mobility. For more transportation options to get around town, go here. It’s that time of year when rainy weather and shorter, darker days are once again upon us. Bicyclists and pedestrians need to exercise extra caution and awareness when commuting to and from work. Whether you’re walking or riding, it helps to know your route instead of trying to navigate on the fly. This allows you to concentrate on your surroundings and instead of looking for your next turn. 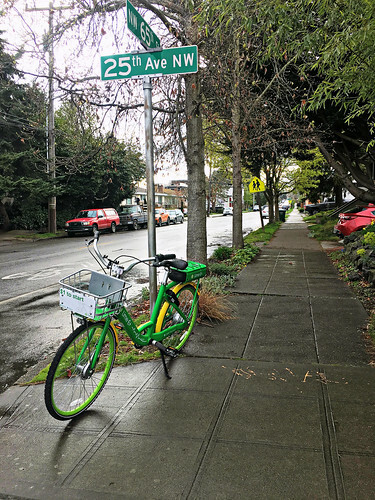 SDOT maintains an excellent bike map that is updated annually, and can be used by bicyclists and pedestrians to map an effective route. If you want to start walking or riding to work, make a couple of trial runs during daylight hours on a weekend. Or better yet, get a bicycle or walking buddy – someone who already bikes or walks to work – who can help you with suggestions for clothing or bike gear for those first few trips. Visibility is the key – wearing bright and reflective clothing is important. Bicyclists should have flashing red tail lights and a steady white light or reflector, in front. It’s also important to be predictable and clear to others on the road of your intended path. If you’re on foot, make it clear to on-coming traffic that you’re about to step off the curb. When riding a bicycle, remember to use hand signals for all turns, stops and lane changes. Seeing other people and objects in low-light conditions is difficult for everyone. Those who drive need to be able to perceive what they are seeing and recognize the importance of a pedestrian or bicycle rider to take necessary evasive action. Bicyclists should obey all traffic laws, and never assume the right of way. Distractions such as electronic devices should never be used while driving or riding – in Seattle, we’ve seen a nearly 300% increase in collisions involving inattention over the last 3 years. Remember, we are sharing the road with an increasing number of commuters, employing diverse modes of travel. Let’s look out for each other.